This article is about the 1982–1990 American movie review series. For the 1986–2010 American movie review series, see At the Movies (U.S. TV series). For the Australian movie review series, see At the Movies (Australian TV series). At the Movies is an American movie review television program that aired from 1982 to 1990. It was produced by Tribune Entertainment and created by Gene Siskel and Roger Ebert, who had left Sneak Previews the previous year. 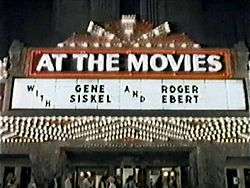 Siskel and Ebert left in 1986 in a contract dispute with Tribune Entertainment; they went on to create Siskel & Ebert (which later adopted the At the Movies title in 2008) with Buena Vista Television. They were replaced by film critics Rex Reed and Bill Harris, a gossip correspondent for Entertainment Tonight (ET). Under Reed and Harris, the show expanded beyond movie reviews, adding show business news and gossip. Harris left in 1988 and was replaced by former ET host Dixie Whatley. During the Siskel and Ebert run, the two adopted the same format they had used in their previous series Sneak Previews which ran on PBS: two critics from opposing newspapers view clips from the week's new movies, discuss them, then pass judgment expressed in thumbs up (to approve) or thumbs down (not worth seeing). During this run they would adopt several elements that would make the show lively. For example, they would bring on Spot the Wonder Dog to help the critics lead into "The Dog of the Week", the week's worst movie. Later, they used another animal Aroma the Educated Skunk. Plus, the critics would also occasionally feature an "X-Ray segment" in which they discussed current trends happening in the movies. None of these extra elements were carried over when the show moved to Buena Vista and became Siskel & Ebert.